† Date of issue, where not 1897. ‡ Gibbons  dates the 3pf brown as July 1898. On 6th November 1884 south-eastern New Guinea became a British protectorate and ten days later the north-eastern portion was declared a German protectorate and named Kaiser Wilhelms Land. In September 1914, Australian forces landed and the German troops surrendered ten days later. In December 1920, Australia was given a mandate by the League of Nations to administer the area. Scott  describes the Territory of New Guinea issue as occupying, "the northeastern part of the island and includes New-Britain and other nearby islands. 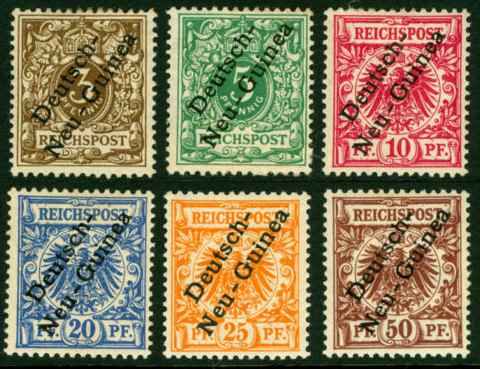 It was formerly a German possession and should not be confused with British New Guinea (Papua) which is in the south-eastern part of the same island, nor Netherlands New Guinea … for previous issues see German New Guinea, New Britain, North West Pacific Islands. Issues for 1952 and later are listed under Papua."